Description: Normally without hairs. The plant sends up many thin, erect stems with blooms in clusters of lavender or lavender-tinted white flowers which have five reflexed lobes that extend down away from the blossom. 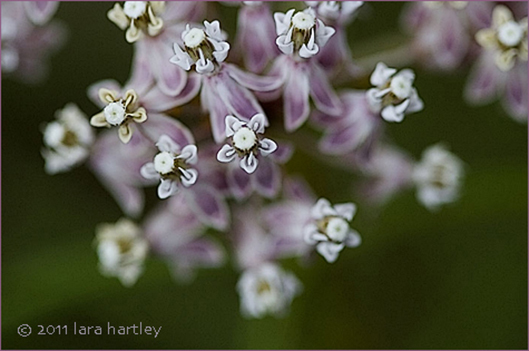 The fruits are smooth milkweed pods which split open to spill seeds along with plentiful silky hairs. Leaf: Long pointed leaves which are very narrow and often whorled about the stem, giving the plant its common names. Habitat: Dry ground, valleys, foothills; springs and alkali seeps in the Mojave Desert. Notes: It is a specific Monarch butterfly food and habitat plant in nectar and vegetation and cocoon habitat plant. The alkaloids they ingest from the plant are retained in the butterfly, making it unpalatable to predators. 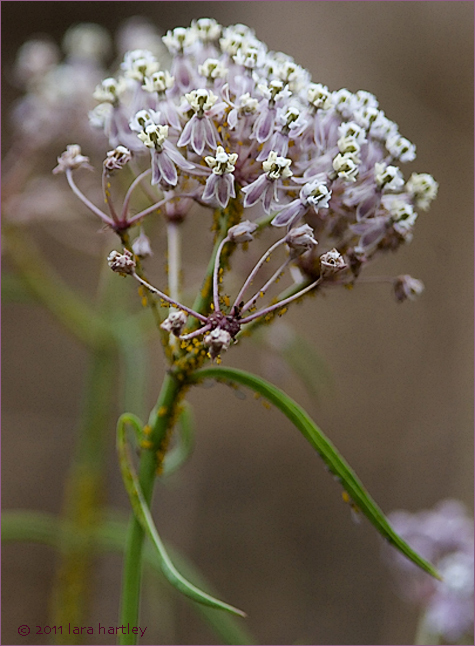 Asclepias fascicularis, a dicot, is a perennial herb that is native to California and is also found outside of California, but is confined to western North America. Distribution outside California: to Washington, Utah, Baja California. It can cause minor dermatitis. Photographed July 22, 2006 with an Canon EOS 20D with a 300mm lens and 1.4 teleconverter. Horticulture information: Given excellent drainage (modification of compacted or other water-holding soils may be necessary), absence of frequent summer water (distance from water-loving plants), and full or nearly full sun (tolerates summer afternoon sun), grows especially well in zones 3, 7, 8, 9, 14, 15, and 18 and also in zones 10, 16, 17, 19, 20, 21, 22, 23, and 24.